OGDEN, Utah -- Emilie Parker, a 6-year-old victim of the Sandy Hook Elementary School massacre, was laid to rest next to her grandfather Saturday in the town where she was born. Burial at Evergreen Memorial Park followed a private funeral for family and close friends at a Mormon church across the street from Ben Lomond High School, where Emilie's parents, Robbie and Alissa Parker, met. 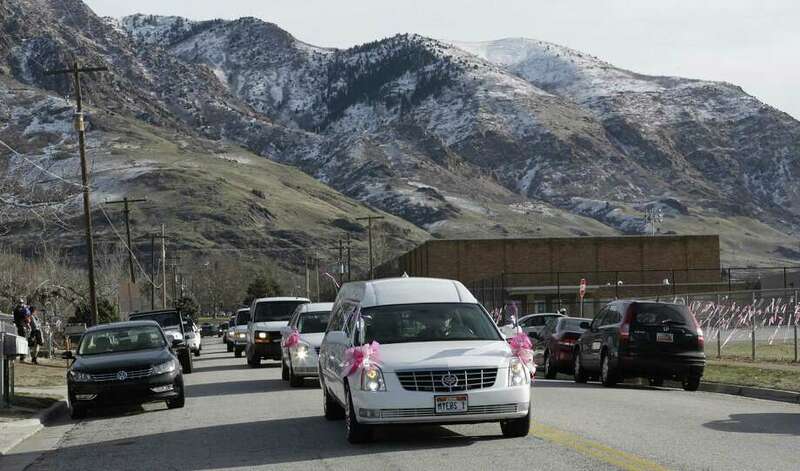 The Parkers emerged from Saturday's solemn service carrying their two other daughters, Madeline and Samantha, The Salt Lake Tribune reported. The girls' coats were pink, their older sister's favorite color. The funeral procession continued through streets lined by pink-clad observers, and by trees, bushes, signs and utility poles draped with pink ribbons and banners. A public memorial service was held Thursday in Ogden for the blond-haired girl, one of the 20 schoolchildren and six adults killed at the Sandy Hook school Dec. 14. The parents had asked for privacy at Saturday's funeral. Plans called for Emilie to be laid to rest in a favorite white dress with an American Girl doll at a gravesite next to her maternal grandfather, who died Sept. 29. Douglas G. Cottle was an Ogden dentist who fell from his bicycle during a 200-mile race. He was recovering from brain trauma but fell and hit his head a second time trying to walk from a hospital bed, friends said. He was 62. Emilie made a card for her grandfather to be placed in his coffin. Robbie Parker, a 32-year-old physician's assistant who landed a job in Connecticut less than a year ago, became one of the faces of the tragedy early on when he appeared before cameras to describe the couple's grief. He told the crowd Thursday he felt a lot of support from the city where he was born and reared and where Emilie was born. The family lived in Ogden until Emilie was almost 3. Then they moved to Oregon, New Mexico and, eventually, Connecticut, where they bought a house and planned to settle down. At Thursday's service, family members remembered Emilie as a "picture of perfection," a girl full of love, compassion, charity and enthusiasm.